Don’t Let Summer Pass You By! Schedule a no obligation in-home consultation with one of our Design Pros now. We’ll provide you with 3-D realistic design and a detailed estimate on your dream pool that will have you enjoying this summer and many more to come. 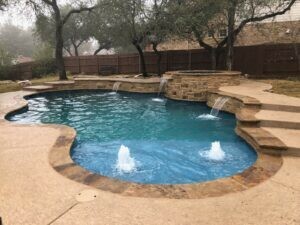 When it comes to choosing reliable and expert pool builders in the Austin TX area, there are many things to consider! For over three generations, the Crites family has built high-quality custom swimming pools and dependable pool renovation services, including pool replastering. We’ve built over 5,000 custom swimming pools and we’re still building more! That’s the kind of experience you need from your pool building company. Our turnkey services have been given a 5-star rating which means we take care of everything from designing the pool, planning the construction, and delivering the finished project as per our client specifications! We stay on schedule and we never go over your pool building budget. We earn valuable referrals by providing our customers with the best pool construction experience! Why choose Crites Custom Pools for your next pool renovation project? Call us today and get started on building your dream swimming pool! Client's Love Crites Custom Pools! Another pool maintenance service told me last year my pool needed re-plastering. Donna looked at it with her job foreman this year and both agreed the plaster should be good for another 5 years or more and that it just needed a pressure wash and an acid wash now–saving me thousands. Very honest and helpful. I highly recommend them. It was a pleasure working with Crites! Even through a few unavoidable mechanical hiccups, Donna was a pro at getting the job done and completed to our satisfaction. After the job was complete, we received phone calls making sure everything was working properly, and letting us know that we could contact them at anytime if we had concerns. Very professional and personable. Would highly recommend this company!! !